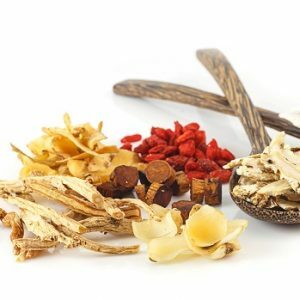 Chinese herbs – what are they good for? Traditional Chinese medicine is used to treat all the same illnesses and conditions that Western medicine treats – but there is where the similarity ends. Whereas Western doctors look for a single cause of illness – usually a bacteria or virus, genetics or an injury – and a single cure, practitioners of traditional Chinese medicine (TCM) believe that many factors can contribute to illness. Susceptibility, for instance, can be related to a person’s constitutional type as well as environmental factors, and illness is caused, not by germs, but by damp, heat, wind or cold all of which can disrupt the flow of qi – or vital energy – necessary to maintain health. Having determined the nature of the illness a person must be treated according to this total picture or the cure will not be complete. Western doctors are rarely interested in such a total picture of a patient. Instead, their training encourages them to see people as specific body parts or chemicals – lungs, joints, heart, hormones and so on. But to oriental practitioners the body is a whole and highly organised system both within itself and also as part of the wider environment. Because of this while a western doctor may diagnose a collection of symptoms as ‘peptic ulcer’, a Chinese practitioner may diagnose any number of separate conditions which may lead to a similar collection of symptoms, for instance: ‘damp heat affecting the spleen’; ‘deficient cold affecting the spleen’; ‘excess cold dampness affecting the spleen and stomach’; ‘disharmony of the liver invading the spleen’; or ‘disharmony of congealed blood in the stomach’. There are also differences between Western and oriental approaches to the way a body functions. In Chinese medicine the organs have much broader functions then are normally assigned to them by Western medicine. The kidney, for example, does not simply regulate water balance, it is a link between sources of energy and growth, the bones and brain, willpower and memory. In ancient China, traditional medicine was practiced as a complete system of healthcare. Today, particularly in the West, Chinese medicine, like Ayurveda, has become fragmented into its main component parts: herbal medicine, acupuncture and Chinese massage (known as tui na). Increasingly Chinese herbs are being shown to be effective and some researchers believe that combining traditional forms of Chinese and Western medicine could offer new hope for developing new treatments for a variety of cancers. But Chinese herbs can be useful for everyday use as well. 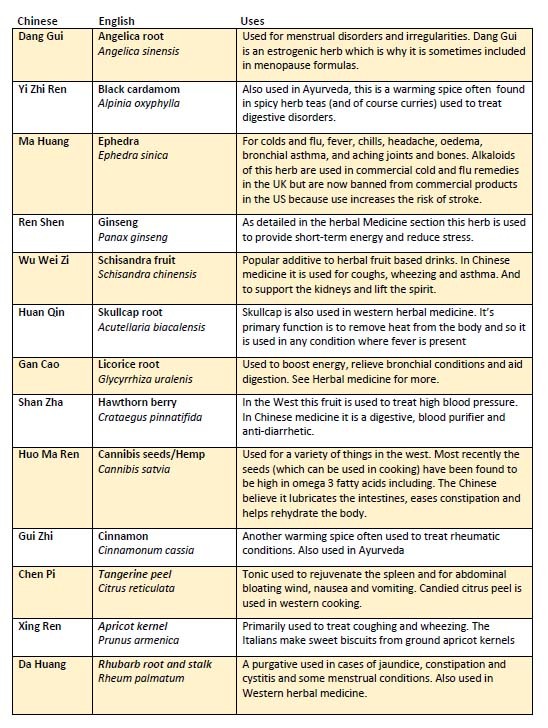 The most popular Chinese herbal ingredients may have daunting sounding names but they are not as ‘alien’ as you might think. 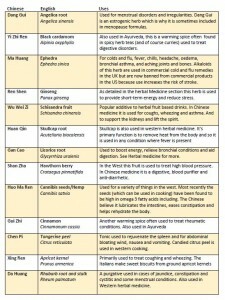 As the chart (right) shows many are also common to Western and other herbal traditions. You can also download a .pdf of the chart here. Even if there is a different between how we in the West think of healing and the way that TCM does, many herbs used in TCM have been shown to bring health benefits. One of the most well-known and widely used of the Chinese herbs, ginseng root (Panax ginseng) is believed by TCM practitioners to increase the flow of “qi” as well as “pi” (usually translated as spleen, though in TCM this has less to do with the organ itself than the energy of that organ.). Supplements have also been shown to relieve fatigue including cancer-related fatigue. Ginseng root may also boost immunity and be useful in preventing and treating influenza. Also known as the goji berry (Lycium chinense) this superfruit is believed in TCM to be able to strengthen the kidneys and the liver. Research by the US Department of Agriculture show that goji berries are rich in bioactive antioxidants. They contain a rich source of beta-carotene as well as zeaxanthins, a type of carotenoid that are important for eye health. Lycium barbarum polysaccharides (polysaccharides are a type of long-chain carbohydrate that can reduce cholesterol, blood pressure, and stabilise blood sugar, but which can have other medicinal effects) which are specific to goji berries, have been shown to have anti-tumour and neuroprotective properties as well as being able to protect the liver from chemical assaults. In TCM, the leaves of the perennial Huang Qi (Astragalus membranaceus) plant are used in TCM as a tonic that is meant to boost the immune system. It’s also believed to treat chronic sores and ulcerations that are supposedly the result of underlying deficiencies of “qi,” or vital energy, and blood. Research shows evidence that astragalus has immune stimulant properties It may also help people with weakened immune systems from chemotherapy or radiation. Practitioners of traditional Chinese medicine also believe it can strengthen the external Qi (the field of energy that surrounds the body) thus helping prevent entry of pathogens. Angelica root (Angelica sinensis) is actually a member of the celery family and considered a beneficial remedy for ‘female’ complaints such as painful periods, PMS and symptoms related to menopause. It has a mild estrogenic effect comparable to soya and red clover, which is thought to be responsible for its normalising action on the female system. Recent research has isolated numerous compounds that could have anti-inflammatory, anti-cancerous, and neuroprotective properties. Ju Hua (Chrysanthemum morifolium) is an herbal remedy derived from the flower and aerial parts of the plant and has been used as a traditional Chinese medicine for the treatment of hypertension, angina, fevers, inflammation and anticancer effects. Consumed mostly in tea, Ju Hua is believed to cool the body down, promote good liver function, and benefit the eyes, as well as treat hypertension. Chrysanthemum has shown some promise in lab studies against breast cancer, by increasing the effectiveness of conventional chemotherapy as well as increasing the rate of cancer cell death. The reishi mushroom (Ganoderma lucidum) was recently shown in a recent animal experiment, to help slow weight gain by improving the balance of good bacteria in the gut. There is some evidence that daily intake of lingzhi may have antioxidant, cardioprotective, and blood sugar balancing benefits. It may also have anti-inflammatory properties that make is useful for allergies and contact dermatitis. Adapted in part from What works, what doesn’t: the guide to alternative healthcare by Pat Thomas (NewLeaf).